378 sq. ft. Myrtha therapy pool with three different water depth elevations (4’-0”, 5’-0” and 7’-0”) to accommodate various aquatic therapies and user heights. The pool has capability for underwater monitoring at the deck-side therapy desk station, and is outfitted with a stair entry, underwater therapy railings, and a Badu resistance jet. 100 sq. ft. Hydroworx polar plunge pool with hydrotherapy jets. 68 sq. ft. Hydroworx thermal plunge pool with hydrotherapy jets. The practice facility is one component of the 160,000 sq. 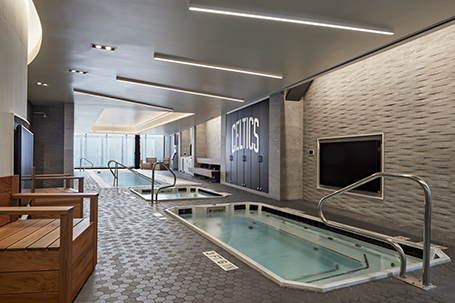 ft. facility which features two state-of-the-art parquet floor basketball courts, sports and science nutrition facilities, expanded strength and conditioning facilities, physical therapy areas, best-in class locker rooms, and player’s lounge. The facility also includes a movie theater, a nap room, a kitchen with a dietitian on site, a barber’s chair in the locker room, a game room with a pool table, and a putting green.